A government policy that was seen as a death knell for several Indian e-commerce companies is instead proving to be a big boon for the sector. The cash burn of e-commerce players in India is expected to decline to 12% this year as compared to 15% in 2018, consulting firm Redseer said in a report on March 31. By 2023 it is expected to come down to 5%. This is mostly thanks to the new e-commerce policy announced last December by the government, barring online retailers from offering deep discounts, Redseer said. Cash burn is the share of a company’s sales that it spends to finance overheads, before generating positive cash flows from its business. Over the past decade, it has led to online players piling up huge losses. “The paring of losses for e-commerce players will be aided by a fall in the number of discounts offered, as internet users mature. As consumers’ trust in the internet ecosystem increases, their stickiness will also improve and drive sales higher despite lower discounts,” said Aakash Goel, a partner at venture debt firm Trifecta Capital. The cap on discounting is also changing the kind of products sold, which is helping companies make more money. The December policy had received flak from the e-commerce industry and was heavily criticised for being restrictive and a roadblock for growth. 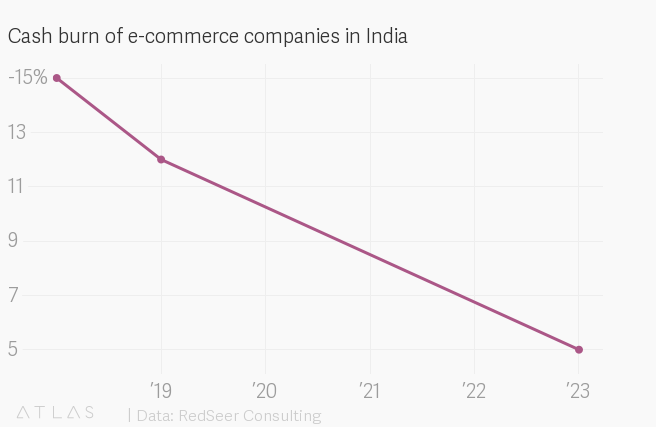 So far, online retail in India has thrived on smartphone and electronics segments. All major e-commerce firms in India have exclusive tie-ups with large brands to sell their products at heavily discounted rates. But these categories have very thin margins. E-commerce firms’ margins in the smartphones and electronics categories are as low as single-digits, whereas, other categories such as fashion, FMCG, and home furnishing products attract margins of 25-35% on an average. With discounts disappearing, the revenue share of other segments is now expected to rise. “The significant shift in unit economics is driven by multiple factors, the most important being the change in segmental revenue split: falling share of lower margin mobiles and electronics and rise in the share of higher margin apparel and home,” said Mrigank Gutgutia, engagement manager at Redseer. The change, according to Gutgutia, is an indication of the evolution of the e-commerce sector where players are focusing more on earning profits with higher-margin products that are bought frequently. “The mobile market has saturated in China also and we see a similar pattern in India. Fashion has been growing faster and it provides comfortable margins as well. In the home category, there are several segments, including furniture and furnishing, which have considerable potential for growth,” Gutgutia said.